Spring is slowly happening. 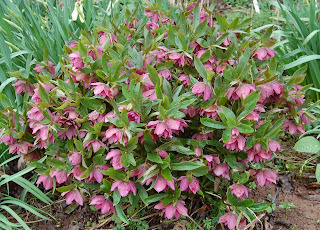 Hellebores been out for several weeks now, but so much later than normal. In this garden every seed which hits the ground grows, so unlike my last garden, even though the soil was so similar (slightly sticky red sandstone). So 2 years ago we dug up loads of seedlings and planted them out in nursery beds, thinking I might use them in a planting to raise the tone of some of the public borders I do in Bristol. But the city seem to have run out of dosh for public planting and have just beheaded the chief of parks, or something along those lines, so the good burghers of the city will have to do without my hellebores. Anyway I did not expect them to be as ‘good’ as the parents (Ashwood Nurseries) but to my surprise they were. No really good dark ones, but lots good reds and spotties and this picotee. Interesting to see an obvious genetic linkage between vigour and flower. The picotee are slow, rather weak plants, the reds very vigorous. The most vigorous is a double, which I am pretty sure I got from Wendy Perry at Bosvigo. Probably sterile as no sign of seedlings. The seed is hand-pollinated and jolly expensive, but they all seem to grow. The contrast with the offerings from the garden centres and the big money breeding programmes is total. 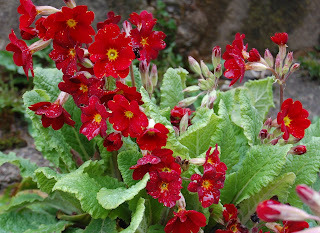 Modern polyanthus seem to get more hideous by the year, as flowers progressively more enormous and colours cruder. I should imagine the breeders are investing in the latest everything-but-GM breeding technologies. The results are truly hideous. Let's save modern genetics for stuff we can eat shall we? One relatively modern hybrid which is fantastic is Narcissus 'Tete a tete' which is a cross-sectional hybrid, so doesn't fit into the various classes which daff-folk have divided the genus. 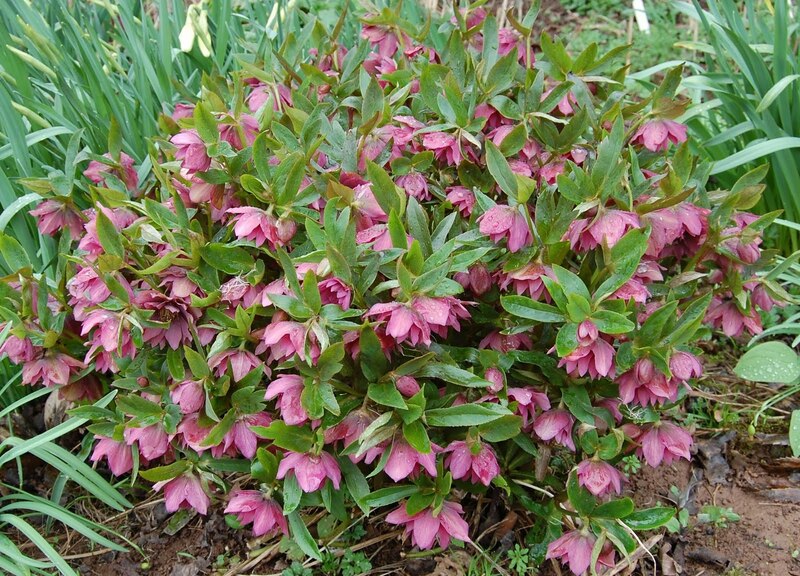 Its incredibly prolific and early and tough and just comes up to brighten the dreariest post - winter border. 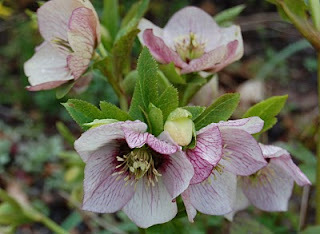 It is one of those plants which is so easy and now so commercial that some are already turning their noses up at it. But me, I'm going to buy a sack of them for next autumn and stick them in everywhere. Also on daff-talk, I see some seedlings of the wild Narcissus pseudonarcissus from the famous wild daffodil area of Newent in Glos. flowered for the first time this year - five years from seed. That's the quickest any daffodil seems to take. Given the disasterous history of introducing predators of pests (like Australias’ cane-toad problem) some have expressed alarm at introducing the insect. This does sound like it has been thoroughly researched though, apparently for several years, to ensure that the bug doesn’t affect native flora - so let’s stop worrying and get on with it. Knotweed is a magnificent plant, which is why the Victorians introduced it - William Robinson in The Wild Garden suggests planting in ‘the pleasure ground’ and by the waterside. Maybe we should blame him? Call it ‘Robinson’s knotweed’ instead of blaming the Japanese. The press of course love Japanese knotweed. They love stories about foreign exotics causing trouble generally. Something about the triffid nature of the story appeals to that elemental need for journalists to frighten people. And of course an excuse for a bit of subliminal racism - have you noticed that the country origin of these scare-plants or pathogens is always emphasized: Spanish bluebells, Dutch elm disease etc. By the way, if you ever see buddleia being called ‘Chinese buddleia’ then you can be sure that someone has decided its a bad thing and is to added to the list of proscribed plants. Japanese knotweed is undeniably a huge problem in a few areas, and an irritant in many more. It is not going to take over the country any more than the entire population is going to be eating raw fish for breakfast, or even spreading miso on toast like I do. There is an unattractive eco-fascist tendency which tends to see all non-native plants as problems waiting to happen, and the knotweed as simply the tip of an iceburg. Some ecologists however have pointed out that some spring wildflowers like wood anemones are able to co-exist happily with knotweed and others that growing alongside rivers it is very good otter habitat. The spread of knotweed since its introduction in the latter 19th century is of course a warning to all in horticulture, that we do need to be responsible with what we grow and where we plant it, but the reality is that the problems we have with invasive aliens is pretty minimal compared to those faced in many other countries. Our long growing season which enables our aggressive grass flora to make vigorous growth for most of the year sees off most potential invaders. And some others, like buddleia, are a positive benefit. I’d be quite happy to see knotweed as yet another part of our flora, kept well in check by the little Kumamoto-bugs or whatever they are called, just popping up now and again by the waterside, just like William Robinson would have intended.